The Kansas EMS Association began in 1996 and has since been active in supporting all EMS providers in Kansas through the provision of seminars, conferences, legislative monitoring, and more. 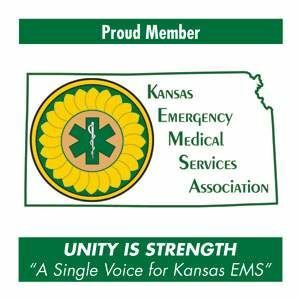 The Kansas EMS Association theme is “Unity is Strength,” through which its members strive to improve the level of pre-hospital care services delivered to Kansas residents and visitors. KEMSA currently offers 3 types of membership, which are individual, service, and squad memberships. View a complete list of benefits here for each type of membership. View a list of service members here. Active members of the Association shall be individuals with an interest and involvement in Kansas Emergency Medical Services (certified and non-certified); and that pay annual dues as determined by the Board of Directors. Said member is entitled to make motions, vote and hold any office of the Association (if they meet the requirements as set forth in KEMSA policies); and is entitled to all benefits of membership in the Association. Other Society memberships are available for no charge. Learn more about societies here. - a membership for the service itself. - a membership the service can buy for its employees, after purchasing the service membership. To join or renew your membership, download membership forms, or pay online, visit our join/renew page here. KEMSA has created an entirely new category of membership. KEMSA associate members are valued members of the association, receiving immediate tangible benefits of access, information, and exposure. See more benefits here.